“Mother's and Daughter's” Family Portrait Painting framed 35″ X 40″ Pastel Painting of this beautiful family was an Anniversary Gift for her husband. 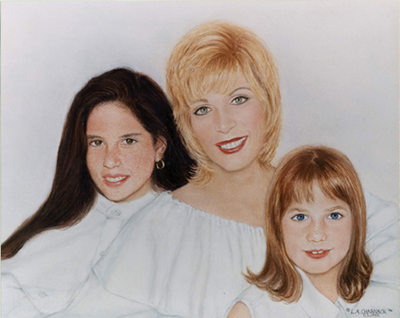 This pastel art is an intimate portrait of the girls of the family. If you desire a portrait of this nature contact me directly and we can talk about your ideas with a free consultation. You may also want to visit the details page for more information about commissioned paintings. This “Mother and Daughters” Family Portrait Painting was an Anniversary surprise for her husband. It was hard to coordinate so we could keep this a secret. We worked odd hours and had many critiques. The Mother wanted the everyone to wear white. The very pretty darker sister on the left was starting here teenage year wearing braces at the time so we all decided to take them out for this Mother and Daughters” Family Portraits Painting. She had the most beautiful slightly freckled skin tone I found just adorable with her gorgeous hair. The younger sister had beautiful hair and a wide eyed look her mother wanted me to capture in the painting. Because she was going to have braces on her teeth we decided her look to be more of innocence. Their exquisite mother was placed in the middle of her children to complete this warm, loving monotone portrait painting. This portrait painting was a surprise anniversary gift. My client’s husband was very emotional when he was presented with this gift from his girls and displayed this pastel painting in his office. Unveiling this painting to her husband who had tears in his eyes was the perfect reaction to his beautiful Girls.